Nosebleeds are messy and annoying, but don’t usually pose any serious problems. Despite their harmlessness, nosebleeds can be quite a pain, as anyone in Glendale, Arizona can tell you. What causes nosebleeds? What can you do to prevent them or stop them once they’ve started? And when do you need to see a doctor? Some causes for nosebleeds are obvious, like a sports injury, punch in the face, or an overzealous nose pick. An ‘idiopathic’ nosebleed has no evident cause, but certain conditions can make you more prone to nosebleeds. When you have a cold or allergies, the blood vessels inside the nose dilate, and can be more likely to bleed. 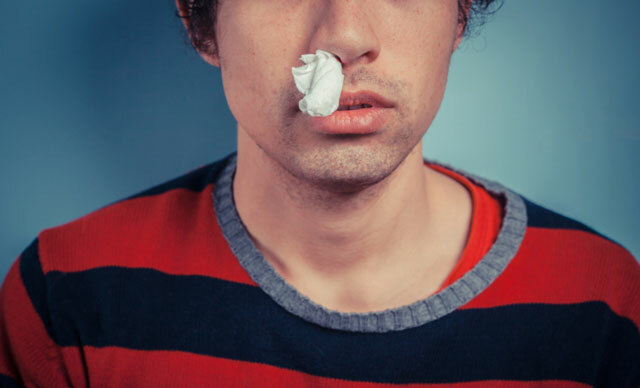 Frequent nose-blowing and sneezing may also trigger bleeding. Inhalation of cigarette smoke (either secondhand or firsthand) can cause a bloody nose, as well as bleach, ammonia, and gasoline fumes. One of the biggest reasons for nosebleeds is dry air, and Arizona is the fourth-driest state in the country. Phoenix, which is less than ten miles from Glendale, AZ, is the second-driest city in the United States, with an average annual precipitation of only 8.2 inches. With low humidity all year long, it’s no wonder we see so many nosebleeds here in Glendale! For starters, there’s the obvious: don’t start a fight with someone who might punch you in the nose, and quit digging for ‘nose gold.’ Keep children’s fingernails short to discourage nose picking. When you blow your nose, use a tissue and do so gently, and if you have to sneeze, open (and cover!) your mouth. If your allergies are acting up, take some allergy medication. Stay away from cigarette smoke and other potentially harmful irritants. As for the dry climate, the best thing you can do is buy a humidifier. Turn it on when the air feels dry, and you (and your nose) will be much more comfortable, particularly during those long, dry Arizona summers. Humidifiers can be especially helpful in your bedroom at night. If you do get a nosebleed, don’t panic, and don’t blow your nose. If you have to sneeze, open your mouth so you don’t sneeze through your nose. Don’t tilt your head back, or the blood could run into your throat. Instead, tilt your head forward and use your thumb and first finger to squeeze together the soft portion between the end of your nose and the hard, bony ridge that forms the bridge of your nose. Keep holding your nose for at least five minutes. Check and see if the nosebleed has stopped. If it hasn’t, pinch and hold for another ten minutes. Holding an ice pack to your nose can constrict the blood vessels and may help stop the bleeding. Once the bleeding stops, wait a while before bending over or blowing your nose to keep it from starting up again. The bleeding goes on for more than twenty minutes. The bleeding was caused by an injury, such as a fall or blow to the face. You get nosebleeds more than once a week. Come to FastMed in Glendale. We are conveniently located on West Happy Valley Road and 39th Drive, and we’re open in the evenings and on weekends. Use ZipPass to check in online, and be seen by the doctor right away.